JewishPost.com - Dr. Oz, Rabbi Shmuley Boteach and Natan Sharansky Discuss Human Rights, Jewish Values and Mideast Politics. 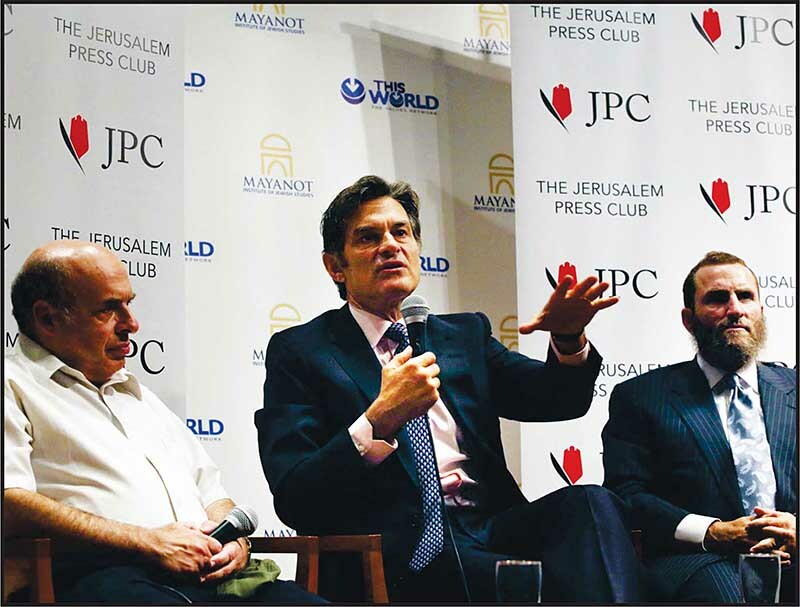 Dr. Oz, Rabbi Shmuley Boteach and Natan Sharansky Discuss Human Rights, Jewish Values and Mideast Politics. The trip was initiated by Rabbi Shmuley who recently awarded America's most famous medical practitioner and his wife as Champions of Jewish Values, together with Elie Wiesel and Dr. Miriam and Sheldon G. Adelson at the annual This World: The Jewish Values Network gala dinner in New York. With the generous support of the Adelson's, Rabbi Shmuley invited Dr. Oz and family on a voyage of Jewish values through the Holy Land. The two American media personalities had originally met as colleagues during their time together as radio hosts on Oprah and Friends. Other highlights of the trip will the Western Wall, Yad Vashem, the Dead Sea, Tiberias, Safed and Masada. In addition, Dr. Oz will make a personal pilgrimage to the tomb of Maimonides, the medieval Jewish doctor who served as personal physical to Sultan Saladin and serves as a symbol of Jewish and Islamic coexistence. Dr. Oz has also been invited to meet with Israel's Prime Minister Benjamin Netanyahu. Dr. Oz and Rabbi Shmuley will hold a panel discussion tomorrow on the civic duty of physicians and clerics, as the ballast of society, to speak publicly on leadership matters will also take place at Rambam Hospital in Haifa. This World: The Values Network is grateful to the Mayanot Institute of Jewish Studies, and its director, Rabbi Shmuley’s close friend Rabbi Shlomo Gestetner, for co-sponsoring and facilitating the trip. The Mayanot Institute of Jewish Studies is a thriving Jewish educational institution and is one of Birthright’s largest trip providers. Mayanot is dedicated to strengthening the Jewish people through inspirational Jewish education and to encouraging its students to become leaders in their communities. Dr. Mehmet Oz, one of the world’s most respected doctors and professor of Surgery at NY Presbyterian/Columbia University, hosts The Dr. Oz Show that airs in 118 countries, including Israel on the Good Health channel. In June 2013, his show won its third consecutive “Best Show” Emmy. Rabbi Shmuley Boteach, the international best-selling author of 29 books has been labeled “the most famous rabbi in America” by The Washington Post and Newsweek and one of the fifty most influential Jews in the world by The Jerusalem Post. He is founder of This World: The Values Network and winner of the London Times Preacher of the Year competition and the American Jewish Press Association’s Highest Award for Excellence in Commentary.